As an FYI, we can custom color match any (most, any if the quantity is right) of our USB drives. We use Pantone Matching System to paint the body of the drive in a specific color. Paint finish can be glossy or matte (rubber paint). Now that I think about it, we can 2-tone paint any drive that is assembled from 2 pieces – like our DE drive. For instance, the bottom side can be red (PMS 186) and top side can be dark gray (PMS 426). Cap is one piece, so you would have to make a choice. Logo can be printed in white. We haven’t done this yet, so you can be the first, the innovative, the remarkable [http://sethgodin.typepad.com/seths_blog/2007/01/how_to_be_remar.html]. 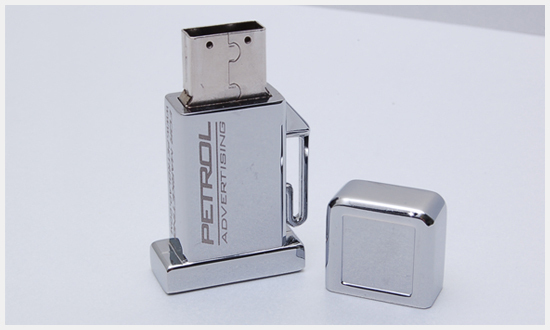 So the Petrol Gas Pump USB drive is finished. You can see all photos below. For more information about this project see these links. L’Oreal has been helping women embrace beautify for over 100 years, and for their 100 year celebration, they combined their core product with our core product. 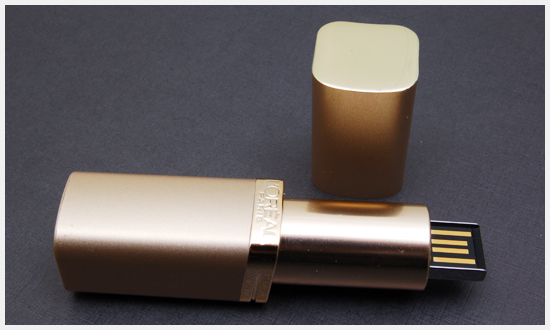 Behold, the Custom USB L’Oreal Lipstick. In early March, Custom USB received a package. Sent directly from the L’Oreal factory, the box contained 500 empty lipstick cases. We were to use the same cases they use for their signature lipsticks and insert our MicroKey USB drives into them. One by one, with strict precision, each Lipstick USB drive was hand-made, hand-tested, and hand-pre-loaded with a video recapping 100 years of exceptional products and services. I spoke with the director of product development at Universal Music Group today. We had an hour long conversation about the state of the music industry, specifically when it comes down to using USB drives in live concert recordings and release of USB music albums. Here’s what can be deducted from our discussion. What is attention worth? Every day I get people (both in the music biz and not) that try to compare the cost of USB drives to CD’s. The fact is, USB drives will never get close to the cost of CD’s – flash memory costs more as well as the cost of other electronic components plus the fact flash drives are reusable. 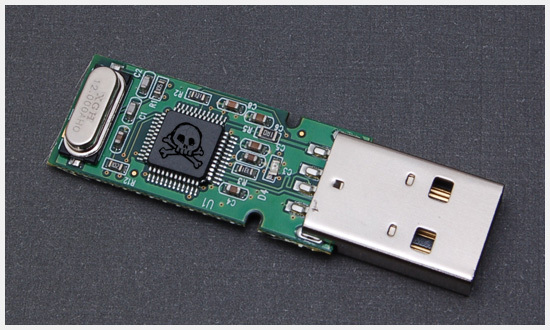 There is just so much more built into a USB drive that you don’t get with a CD. The bottom line is, if all of these value-added attributes are of no value to you, stick with CD’s. If you have no budget, stick with CD’s. If you want to stay boring, stick with CD’s. On the other had, and especially when it comes to the music industry, I think everyone has gotten tired of the guy on the corner passing out his CD demos. There are too many things in front of our eyes that beg for our attention as is , everything that’s not new and different is invisible. This is where USB drives come into play. I have plenty of clients (like Chester Wilson and Thr3efourteen of Mega Beat International) who go to conferences and conventions and build a contact list of people they want to work with. The first time I met Chester (at a dental convention in Chicago – YES, he is also a dentist) he did not know what pre-loading was (if you don’t know, look it up – HERE). Now, he gets drives for every event he goes to (not to mention, gives my name to everyone he meets). Because he was able to grab attention of the right people he now works with Rick Ross, Trick Daddy, and is about to make a soundtrack for a motion picture. Don’t get me wrong, Chester and Thr3efourteen are good at what they do, but a lot of times that’s not enough, you still need to get noticed. The second thing we discussed, was live concert recordings. While this sounds like a good idea at first, it’s a tough gig to get into. Think of who is involved in putting together a live performance – the artist, his manager, the label, the venue, not to mention the people that hold the rights to the music. Try getting all of them to agree on the same thing, let alonegive up commissionable rights to live performance sales. Bottom line, the USB music idea works perfectly when done in the right context. I mentioned this before, but it’s worth repeating. The music is not the product, the artist is. 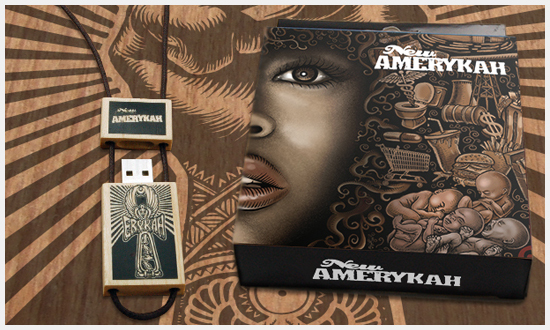 USB drives (and other merch/specialty products) help reinforce the identity of a well-known artist. They are souvenirs of the experience the fans take part of. In this lies value. For some, this is a completely different way of thinking about what they do and how they do it. For others (like Radiohead, Mars Volta, and Lamb of God) it is a well aligned mechanism for building brand equity. Either way you look at it, it’s all about proper context. 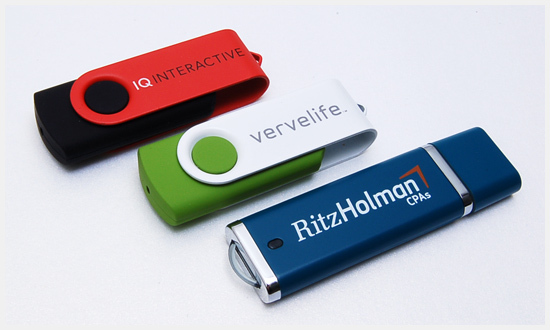 USB Press Kits have always been a popular application for our products. 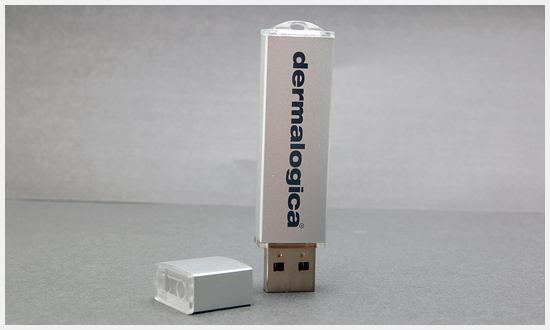 This last one is an Etch2 model USB drive produced for Dermalogica, a company specializing in skin care products, sold exclusively through a network of skin care professionals. The sleek look of the Etch2 USB drive matches the clean brand essence of the company. Their logo is printed in their signature Pantone 431 on the silver body of the drive. Each drive is pre-loaded with 1.5GB of information about the company (logos, bios, case studies). They will be given out to PR agencies and independent PR reps all over US. “Woof woof,” is what you would be saying at this point if you were a dog (unless you are a dog, in which case, say it with me). Seriously, though. This product is so new, it’s not even on the website. I just received it and it’s excellent. The built quality is solid, the USB drive slides in and out, and the overall feel is just great. And it comes in a nice tin gift box. Ordering for your platoon? Then get them engraved and your navy seal will never rub off. Are you a rapper? Perfect for releasing your next album. Works great with USB TurnKey. Tech start-up? Give a little edge to your next tradeshow giveaway. Construction company trying to get the next contract secured? Use these drives as a leave-behind at a meeting. Pre-load them with your portfolio or proposal. Here is yet another version of what your next music album can look (and sound) like. 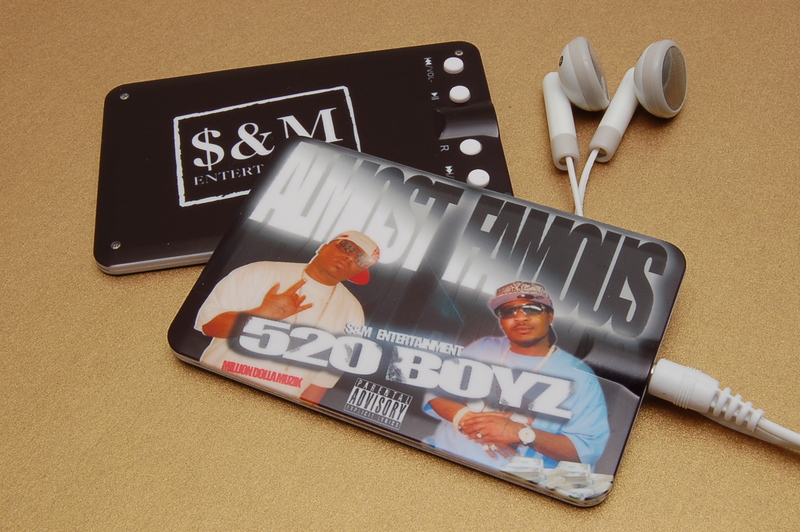 This is a custom Card Disk MP3 Player music album we just published for 520 Boyz. Pre-loaded with some urban beats (Album Release Date: April 1, 2009) and printed with a full color artwork, these suckers [mp3 players] will be sold at their next live show. The Card Disk MP3 Player is perfect for releasing your next music album. It has a slim design the fits into any pocket, large printing area so you can cover the entire player with your album art and a simple user interface so you can turn on, plug in, and jam. Thank you Vadim… The mp3 players are beautiful. Just to give you a heads up… I will be calling you in the near future to place another order. We have been producing custom USB drives for quite a long time (we created the market, actually). And while I generally prefer not to use terms like “the leader in customized USB technologies,” we are extremely “well endowed” when it comes to giving people the most unique flash drive experience. 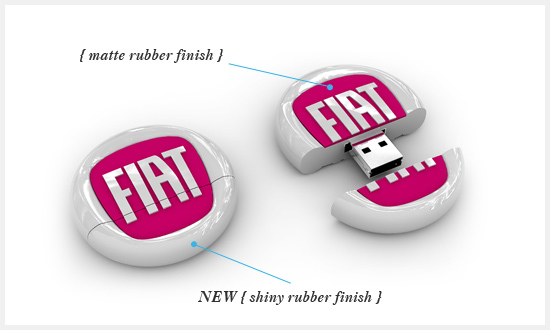 One of the most popular ways of producing a custom USB drive is to utilize our rubber molding service where we create a completely custom flash drive in a shape of your logo or product. Take a look at our photo gallery [http://www.flickr.com/photos/molotalk/] and tell me if this is not the coolest thing you have ever seen (unless you’ve seen this guy: http://bergie.iki.fi/blog/when_reality_meets_product_concepts/). In any case, we’ve now upgraded our rubber molding service with an ability to make parts of the drive glossy. You can now combine matte and glossy textures for a completely unique look. I am still waiting for samples to arrive so stay tuned for more updates. For more info on our custom tooling services go http://www.squidoo.com/usbshapes and HERE. When Brian Halladay aka WHATZISFACE? performed at SXSW 2009, he put together a mix of limited edition DJ sets which he distributed using our Flash Band USB Drives. That’s pretty much it, just wanted to brag.